Communication Prof. Laura Kipnis, shown here on Thursday, June 4, 2015, was investigated for complaints that she violated the federal Title IX law against gender discrimination with her essay "Sexual Paranoia Strikes Academe." Kipnis has filed a motion to dismiss a Northwestern student's lawsuit against her. 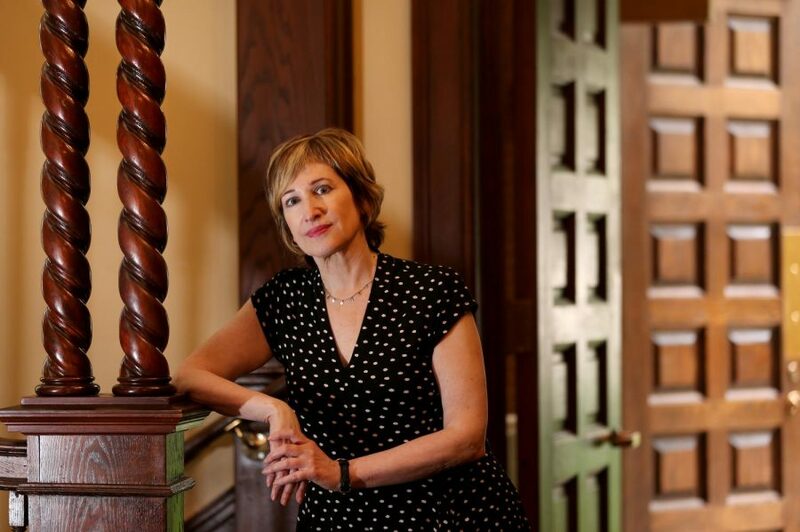 Communication Prof. Laura Kipnis and HarperCollins Publishers, LLC, filed a motion July 21 to dismiss a Northwestern graduate student’s lawsuit against them. The graduate student, using the pseudonym Jane Doe, filed the lawsuit May 16 alleging Kipnis’ recent book, “Unwanted Advances: Sexual Paranoia Comes to Campus,” misrepresents facts about Doe and “gratuitously discloses private and embarrassing details” about the student’s personal life. Published by HarperCollins, the book, which Kipnis said is a polemic, critiques NU’s Title IX procedures, examines Kipnis’ own experience with the process and looks at separate incidents involving two students — one of whom was Doe — filing sexual assault complaints against former philosophy Prof. Peter Ludlow. Since its April 4 release, “Unwanted Advances” and Kipnis have received nationwide attention with reviews and features in publications including the New York Times, The New Yorker, National Public Radio and Mother Jones. Doe filed the suit on four counts, including public disclosure of private facts, false light invasion of privacy, defamation and intentional infliction of emotional distress, according to the lawsuit. She is suing for an unspecified amount of compensatory and punitive damages, and to grant further relief if the court sees just and proper. Doe’s attorneys have until Aug. 21 to file a response to the motion, according to court documents. Jennifer Salvatore and Julie Porter, attorneys representing Doe, declined to comment. Kipnis also declined to comment. HarperCollins did not respond to a request for comment. In a memorandum filed July 21 to support the motion to dismiss, lawyers representing Kipnis and HarperCollins allege Doe’s claims “arise from her fundamental disagreement with the opinions expressed in the book.” The memorandum states Doe and Kipnis having opposing views “does not give rise to any viable cause of action” and argues for the dismissal of all four counts of Doe’s suit. According to the memorandum, facts about Doe were already made public when Ludlow sued the University for defamation and gender discrimination in 2014. These facts include the details of her relationship with Ludlow and the confidential records from the University’s Title IX investigations, the memorandum said. The memorandum also says Kipnis’ book contains information regarding a matter of public concern, citing a 1989 Supreme Court case. The decision states media publications cannot be punished under the Constitution for publishing lawfully obtained truthful information that is important to the public, unless the information affects state interests. In the book’s introduction, Kipnis wrote she is using the details of Doe’s relationship with Ludlow as a way to examine Title IX enforcement and sexual attitudes on university campuses, the memorandum said. A person claiming defamation or false light must allege the specific words he or she is complaining about, the memorandum said. Doe’s lawsuit only “vaguely referenced the statements she challenges as representative ‘categories’ of actionable statements,” according to the memorandum. Doe’s lawsuit alleges Kipnis and HarperCollins “branded (her) as a manipulative liar” and “mischaracterized her relationship with Professor Ludlow.” However, the memorandum states the book represents Kipnis’ opinions, which are “based on the mountain of concededly truthful facts” pertaining to Doe and Ludlow’s relationship and the Title IX investigation. The memorandum argues the defamation count should also be dismissed because Doe did not claim facts which show Kipnis and HarperCollins acted with actual malice, the knowledge of falsity or a reckless disregard for the truth. According to the lawsuit, part of the reason Kipnis allegedly wrote the book was to retaliate against Doe for filing Title IX complaints against her and Ludlow. Kipnis’ alleged animosity toward Doe is “insufficient to plausibly allege malice” because it does not “equal subjective awareness of falsity,” the memorandum said. The suit also alleges Kipnis omitted facts in the book that would have contradicted Ludlow’s story. The memorandum states Doe’s allegation does not support actual malice because though “commentary is one sided and sets forth categorical accusations” does not mean the publisher believed it to be false. According to the memorandum, Doe’s claim that HarperCollins did not “adequately investigate” the book’s content is also “not sufficient to establish” actual malice as a matter of law, the memorandum said. If Doe cannot claim defamation, the memorandum says it would be “fatal” to Doe’s false light claim because defamation is the basis for false light. Proving the existence of actual malice is another “essential element” of a false light claim, the memorandum said. The memorandum cites a 2011 Supreme Court case ruling to argue Doe’s fourth count alleging intentional infliction of emotional distress also fails because the book is “speech on a matter of public concern.” Additionally, the First Amendment prevents any intentional infliction of emotional distress claim where plaintiffs fail to plead the fault requirements for defamation, the memorandum said. The memorandum goes on to say Doe has not pleaded the elements of an intentional infliction of emotional distress claim because Doe must allege Kipnis and HarperCollins’ conduct was “extreme and outrageous.” Kipnis’ book would have to “go beyond all possible bounds of decency” and be “regarded as intolerable in a civilized community,” according to the memorandum. In addition, the memorandum states Doe must show she suffered emotional distress “so severe that no reasonable man can be expected to endure it.” Doe’s claims of distress lack evidentiary support, the memorandum alleged. Doe, however, alleges in the lawsuit that the widespread publication of Kipnis’ book has caused harm to her reputation, career and education. Doe has also experienced economic and non-economic damages, such as mental anguish, as a result of the book, the lawsuit said. The motion to dismiss follows other motions filed in July, including a request from both parties to reset the initial status conference date, which was filed July 5. On July 10, the court approved the date change and the initial status conference was rescheduled from July 18 to Oct. 18, according to court documents.